Football Association chairman Greg Dyke insists the FA Cup semi-finals will remain at Wembley to offset the cost of building the stadium. 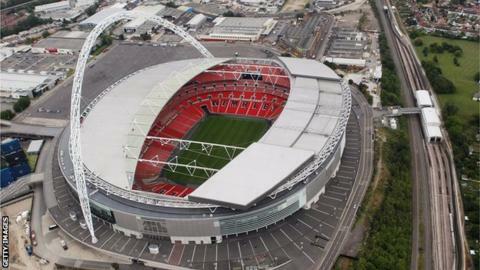 The new Wembley cost over £750m and has staged the semis and final since 2008. Moving away from the tradition of hosting the semis at neutral venues around England has drawn criticism. Dyke said on BBC Radio 5 live's 606: "It is about the economics of building a stadium like this and having to use it to make enough money to pay for it." He was responding to callers on the programme in the aftermath of Wigan Athletic's penalty shootout semi-final defeat by Arsenal on Saturday. "There were 80,000-odd people here," he added. "It was an enormous turnout. Where would we play it to get those sorts of numbers? Villa Park? You would get 40 or 50,000. "The FA took a commitment when they built the place that the semi-finals would be here. So that is where it is at the moment unless the contractual situation changes. I can't see that happening." Dyke also responded to criticism that the FA Cup final has lost some of its magic after sacrificing its traditional kick-off slot of 15:00 BST on the final Saturday of the season. It was played before the final weekend of the Premier League season last year, at 17:15 BST. This year it is still being played in the evening, but the weekend after the top-flight is finished. When Wigan beat Manchester City in last year's final, they were relegated three days later after having to play Arsenal in a Premier League game. "I don't necessarily agree in moving back to three o'clock but I certainly agree that, if we can, it is the event to finish off the season," Dyke added. "It would be great if it was the only match of the weekend and then it could become a big event." The BBC has secured a four-year shared rights deal with BT Sport that will see both broadcasters show the FA Cup from the start of the 2014-15 season. "If we can get the FA Cup referred to on all sorts of programmes and all sorts of ways, I think you will begin to see the revival of the FA Cup as we used to know it," Dyke said. "I don't think it has helped being on ITV, even though they will get upset about saying that." Listen to the podcast of 606 featuring Greg Dyke.